Mansfield Town v Exeter. 'Mal Benning turns away after putting Mansfield in front in the first half. Mansfield Town were sickeningly beaten by a penalty on 90+7 minutes in the six-pointer against play-off chasing rivals Exeter on Saturday. The gut-wrenching twist came as Matt Oakley played a high ball from the middle out to the left where Reuben Reid got into the area, and was heading for the byline when he dived with Rhys Bennett in close attendance. From our pitchside video footage there was no foul from Bennett and it was a clear dive from Reid, but the referee pointed to the spot. Reid stepped up and sent Kean the wrong way from the spot. It was as sickening an end to a game as you can get, and a big blow to the Stags’ play-off chances. It was an exciting game, and with the Stags the better side in the first half and Exeter the better side in the second half, a draw would probably have been a fair result. 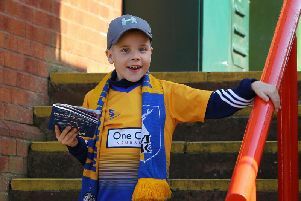 That last gasp penalty though made the difference between Mansfield being one point outside the play-offs, which they would have been if the game had ended as a draw, instead of four points outside the play-offs, as Stevenage, Luton, Exeter and Carlisle all won and occupy those play-off places. Six games to go, starting with the game at leaders Doncaster next Saturday and Mansfield will surely need four wins from those six games as a minimum to stand a chance of forcing their way into the play-offs. That will be a tall order but still very much possible. The Stags have to dust themselves down and produce a great performance in the first visit to the Keepmoat Stadium to bounce back. The Stags had had the better of the first half and after Danny Rose had headed against the bar, the Stags were deservedly in front when a great crossfield pass from Joel Byrom from the right, was controlled by Mal Benning on the left whilst in mid-air. Benning got the ball onto his right foot in the area and swept his shot past the keeper into the right corner of the net. It was his first goal of the season and a wonderful goal at that. Exeter played very well in the second half, pushing Mansfield back, and eventually grabbed a deserved equaliser on 84 minutes when Ryan Harley fired home after a fine move. In an exciting finish, the Stags had nearly regained the lead on 90+4 minutes when Shaq Coulthirst teed up Ben Whiteman whose low shot was brilliantly saved by keeper Pym at full stretch. It was a matter of small margins as Exeter then won it with that late twist. I have been giving my player ratings for every game this season, and following Saturday’s game, and with just six games to go this season, these are my average player ratings based on the 48 league+cup games so far this season (top four players): Shaq Coulthirst 7.00, Joel Byrom 7.00, Ben Whiteman 6.94, Mitch Rose 6.89. Note: only ratings for players starting a game are included, ie sub appearances are not included. Minimum 10 games started. Note that if only the games since 1st January are included, then Danny Rose shoots to the top with an average of 7.38 (from eight games). Saturday’s match ball was sponsored by former Stags fanzine DejaVu in memory of Chris Taylor, the legendary and popular Stags fan who organised away travel for so many years, who passed away two years ago. He is much missed.